From left, Molly Carney as Belle, Maddie Goss as Sleeping Beauty and Elizabeth Profeta as Elsa, share a laugh with 11-year-old Tymere Patterson of Harrisburg during the group’s visit to Penn State Children’s Hospital. 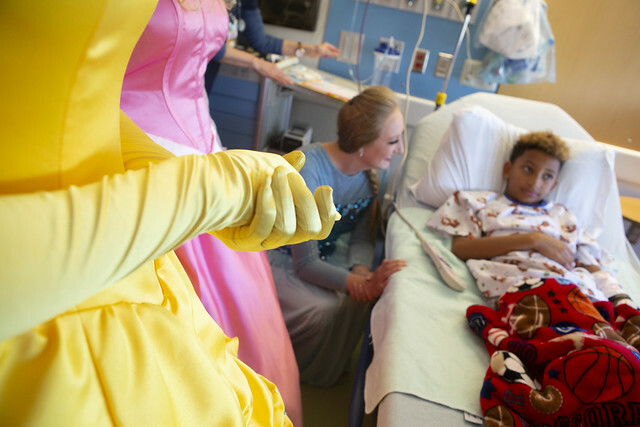 As the minutes ticked closer to his surgery, 11-year-old Tymere Patterson got more and more anxious—which made his parents more and more anxious—until suddenly Sleeping Beauty, Belle and Elsa swept into his room in all their princess glory. The distraction of their visit—even though they were princesses and not Superman—was enough to put a smile on Tymere’s face and help him forget about the butterflies in his stomach. The princesses were actually Penn State College of Medicine students who volunteer with BraveCubs, an organization that brings well-loved characters to life for young patients at the Children’s Hospital. The name honors the bravery of the pediatric patients and is also a nod to the Penn State Nittany Lion. Sponsored by the Division of Urology at Penn State Health Milton S. Hershey Medical Center, BraveCubs is the first collaborative effort of its kind at a medical school and academic medical center nationally, according to Dr. Amy Burns, pediatric urologist, faculty adviser and founder of the student interest group. See photos of a BraveCubs’ visit to the Children’s Hospital. The children—whether 2 or 12—seem to forget their fear as they rush up to the costume-clad students, hug them and pepper them with questions about how they got to Hershey from their faraway kingdoms or Metropolis. “Kids won’t necessarily remember the experience of coming to the hospital, but they will remember how they felt, so we want to make it a positive feeling,” said BraveCubs Co-President Grant Owens, a third-year student. It isn’t just the kids who get excited as Olaf, the loveable snowman from “Frozen,” or Snow White strolls by. Medical staff also light up when they cross paths with these well-loved visitors. “Everyone has a little bit of kid in their heart. It’s good to bring it out once in a while,” Bozorghadad said. In fact, Burns said she hopes the club can impact the anxiety and depression that providers, nurses and medical students may experience by investigating how participation in a group like BraveCubs improves their well-being and reduces burnout. The students say being involved helps them as much as the kids because it’s a great stress reliever after hours of studying. “It’s a way I re-energize myself,” Owens said. BraveCubs members have big plans for the future that include dress-up events for special needs children, home visits for chronically ill children and participation in community events. They also plan to host a “Princess Tea Party” and “Hot Dogs with Heroes” ticketed events for the community as a way to become self-sustaining and raise money for the Children’s Hospital, Burns said. Meanwhile, BraveCubs was honored to receive a grant from Children’s Miracle Network. Third-year student Elizabeth Profeta, aka Cinderella, recalls the dad who recorded her entire visit on his cell phone. “I just imagine the family watching the video over and over to remember the time that Cinderella visited them in the hospital,” she said. Molly Carney as Belle, top-left, and Elizabeth Profeta as Elsa share a laugh with Emily Davis, bottom-left, and other nurses. Entry filed under: Features. Tags: BraveCubs, Children's Hospital, Penn State College of Medicine, Princesses, superheroes.